Following the lead of the Department of Justice (DOJ) in Washington, DC, the Attorney General of the State of New York, Andrew Cuomo, has brought a lawsuit against Intel, calling them a monopolist. While Intel has recently settled legal claims with rival AMD (mostly due to patent disputes as well as some anti-competition charges), Cuomo is suing Intel on the grounds that they are a monopoly and have stifled competition. Over ten years ago, I lobbied the US Congress against the DOJ’s case against Microsoft on similar grounds. At the time did Microsoft do some bad “evil empire” things that they were able to do since they were so big? Yes. Enough to warrant an anti-trust legal battle? No. The free market was able to sort it out on its own, far better than the legal remedies brought by the DOJ. When Microsoft got all big and lazy with dominate Internet Explorer market share, boom, Firefox came out of nowhere and handed Microsoft its lunch. Now Microsoft is starting to invest and innovate in the browser space, but now has to deal with not only Firefox, but Chrome and Safari. The free market did loads more to spur innovation and regulate Microsoft than the anti-trust trial even dreamed of doing! Same with Intel, allow the free market to decide, not lawyers. Fellow New Yorker and good friend Andrew Bust wrote an opinion here. Andrew is a registered Democrat and I am a registered Republican. We both agree on this issue. The last time we agreed on a political issue was when DOS was the primary operating system used. Let the free market regulate the industry and don’t let the government stifle innovation. Sign a petition here. 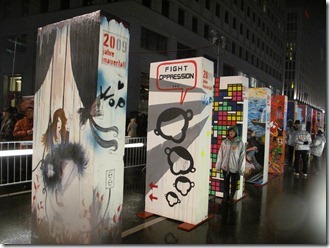 I am in Berlin for TechEd 2009 while Germany is celebrating the 20th anniversary of the Berlin Wall falling. Today most of us take for granted the society we live in, however, when I was growing up Eastern Europe was “the enemy”, all colored red on a map. We were not free to do business with the “eastern block”, nor were we allowed to visit without permission. Today that is all gone and I now work for a company that was behind the “iron curtain”, a company that would never have existed if the Berlin Wall did not fall. Last night we walked down by the Brandenburg Gate and downtown Berlin. I listened to amazing stories from my colleague at Telerik, Jan Blessenohl. Jan is German and was in university in 1989. On November 9th, he actually traveled to East Berlin to buy some cheap textbooks when the protests overwhelmed the Berlin Wall and when it fell he was right there at the Brandenburg Gate standing on the wall, a part of history. The speaker gift at TechEd was a piece of the Berlin Wall! 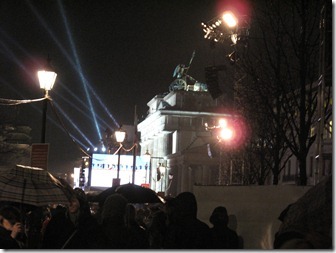 I went to the Brandenburg Gate area near Potsdamplatz this evening to watch the ceremonies. What was really cool was that there were 1,000 foam dominos lined up to fall, each decorated by 1,000 artists around the world. Because there were 1,000 of them and it was pouring rain, I got to get up close to them and take lots of photos. I am writing in response to the Request for Public Comments regarding document formats and interoperability. I am a technology professional who has spent many years envisioning, implementing and maintaining solutions for companies both large and small. Given the enormous diversity of needs most companies and governments have internally, I am concerned that your office is heading down a path of mandating a solution that will limit choice and increase costs for our State agencies. Companies I have worked with over the years, such as Microsoft, Goldman Sachs and the National Football League, often have the same concerns that the State does: accessibility to documents, interoperability, and longevity. But each company and each department may have different needs. So solutions are created with goals in mind, rather than to a specific, locked-in solution. Your study suggests the opposite approach, forcing every department and office to build strategies around a locked-in, one-size-fits-all technology. If your agency decided to prevent any text document from being stored under existing methods - requiring even the simplest text note to be stored in a new, untested format called ODF- it would force the state to undertake a massive conversion of all existing documents for data retention and indexing. Even if the tools to do this significant transition were free, the testing, rollout, and support costs would be enormous. Finally, locking every state agency and department into today's technology could be the equivalent of mandating 8 track tapes in the era of CDs. While XML is hot technology right now, it's important to note that just a few years ago, the HTML standard used for the web was a wild new idea. Archie, FTP and Gopher were to tools of the day - now they are almost unheard of. If we have learned one thing in the past decade, it's that technology changes quickly. I would urge the State to allow Agencies and departments to choose the format and technology that best serves their needs, rather than a locked in solution that may fit no one's. In Saudi Arabia, a country not known for its openness, blogger Fouad al-Farhan has said: “The television stations are completely owned by the government. The newspapers are highly censored, and some of their chief editors have been in their positions for more than 30 years.” Fouad has found a way around the establishment and censorship: a way to have his voice heard, and a way to have his ideas expressed directly to the Saudi Government and the world. He does this through his blog. On December 10th 2007, he was jailed for “violating the rules of the kingdom” or basically expressing free speech. US President George Bush is due in Saudi Arabia this week on a tour of the Middle East. While he is there, President Bush is going to press the Saudi Arabia leaders to release Fouad. The President of the United States, one of the most powerful men in the world, is going to come to the defense of a normal Saudi citizen who he has never met. A blogger. On January 10th, Reporters without Borders sent an open letter to the Saudi Monarchy asking to have Fouad released. A reporter? No, a blogger. These two incidents have shown us the power of technology. Authoritarian regimes have successfully suppressed free speech throughout the course of human history. For the first time in human history, the tide has turned; the authoritarian regimes can’t fight the blogs. For the first time in human history, the masses have the edge. Sure China can censor Google and run tons of pattern recognition software to disallow blogs and other Internet media, but as soon as they ban one, another will come up. It is similar to the RIAA and Record Companies suing Napster and College Students. Authoritarian regimes now have to cope with their citizens now having a voice. A voice heard by the entire world. Get ready for Civil Disobedience 2.0. This Sunday I am going to see the Dalai Lama speak at Rutgers University. The topic is “Peace, War, and Reconciliation.” I am curious to see how he approaches the topic of <?xml:namespace prefix = st1 ns = "urn:schemas-microsoft-com:office:smarttags" />China and Tibet. Not being a fan of Richard Gere I do find the Chinese occupation of Tibet wrong. I can say this having visited the region several times and spending a lot of time there making friends with the locals in Tibet, Bhutan and Nepal. I hope the Dali Lama speaks to this. So January 30th there will be elections with or without the Sunnis. Osama bin Laden said anyone who will vote is an infidel. Just like in Afghanistan where the radical Sunni Taliban allied with bin Laden are still in their holes protesting the first freely elected leader in Afghanistan’s history, Zarqawi’s Sunni Muslims will just get more radical and blood thirsty with an alliance with bin Laden, boycott elections and live in their holes. Just like in Afghanistan, moderate Sunnis (like the moderate Sunni non Wahhabist Taliban) did not align themselves with terror and wanted to be part of the political process and laid down their arms and formed political opposition parties. Moderate Sunnis will do the same in Iraq. Sure some will stay home, but they know that the majority of the population made up of Kurds and Shiites (both previously gassed by Saddam) would rather die then not vote and will not risk staying out of the process. The Sunnis can see the writing on the wall. Will Zarqawi’s terror continue? Unfortunately yes. How do we stop them? Hold free elections January 30th and give the people a stake in their government. Zarqawi’s Sunni “insurgent” group is not an “insurgency” but just a radical group of terrorists opposed to democracy-as his alliance with bin Laden now proves. Let’s now call a spade a spade and label his group terrorists. His legitimacy has sunk even lower with moderate Sunnis with the bin Laden alliance. As democracy grows in Iraq over time Zarqawi’s group will diminish. It will take time, maybe years as it did in Afghanistan. Lastly, we need not worry about Iran, the Shiite power next door. Elected moderate Iraqi Shiites will reject the radical non democratic and non Arab (Iranians are not Arabs, Iraqis are). Moderate Sunnis will come to the forefront and Zarqawi’s Sunni terrorists will eventually be isolated and marginalized, just like the radical Taliban were in Afghanistan. It took only three years in Afghanistan-give Iraq time. Fast forward 10 years from now. A democratically elected free Afghanistan, Palestine and Iraq. Traffic Free Central Park-A Reality? The DOT is going to close for good some entrances and implement carpooling, so there will be less cars to try to kill us. They did lower the speed limit to 25 mph, that will be hard to respect on the bike! This is a great step. One of the great benefits of being an RD who speaks at conferences around the world is making friends all over. Usually my IM boxes open at any given time include at least someone from two or three different continents. While we all agree on development strategies and methodologies, we don’t always agree on politics. Friends can have a spirited discussion on sensitive topics and disagree-but remain friends. Here is an exchange between Boston RD Patrick Hynds, one of the smartest RD on the planet, myself (not so smart) and our friend in Egypt Mahmoud A. Gomaa. Mahmound sent us a chilling graphic of a dead or injured Iraqi civilian. Below is our exchange. this photo attached, is for an Iraqi civilian, killed while he was carrying his daughter, running from the wild attack of American troops in their compain againest terrorism!!!!!!!!!!!. No one likes the consequences of war, unless they are insane. I regret what is happening in <?xml:namespace prefix = st1 ns = "urn:schemas-microsoft-com:office:smarttags" />Iraq and what is happening in places torn by war without US involvement. I am of Irish decent and I view what is happening in Iraq as very similar to what happened for decades in Northern Ireland. The British came in under circumstances that they thought were correct and hoped to only stay for a short duration. The actions of the Catholic terrorists of the IRA (yes I am catholic and yes they were terrorists) kept the British troops there for most of the century. Many civilians were killed by actions on both sides, but most often I blamed the IRA insurgents (my own people). Luckily that mess is mostly over. Now Iraqi fighters get to decide if they want to keep American troops for a century or not. There is not enough oil in Iraq to pay for our being there for another 10 years. If we took all the oil Iraq produces for 10 years without paying a dollar it would not pay for the American costs of the war up to this point. I have fought a war as an infantry soldier. I still feel horrible guilt for the soldiers I have killed knowing full well that they would have killed me had I acted less swiftly. I have seen our military prosecute offenses (and our troops are only human so they do occur) more rigorously than any other military in the world. I hate to see this kind of thing, but I honestly blame the insurgents for the vast majority of the death of the innocents. I also have seen for myself the atrocities committed by Saddam while I was in the first gulf war. The attacks on New York and Washington in 2001 have changed many goals and perspectives of the US government and of most of its people. When the Japanese attacked us at Pearl Harbor they awoke a sleeping giant. Bin Laden has done it again and the consequences have and will continue to be long reaching. I understand that much of the world (Arab and non-Arab) are upset by US tinkering in the middle east especially support for Israel and the first Gulf War. I have no illusions that there is a single country in the world that would not be forcing their will around the world if they had the ability to do so. I don't blame all Egyptians, Jordanians or Saudis for the attacks on the World Trade Center. I don't blame all Iraqis for the deaths of my friends and classmates who are serving in the US military in Iraq. I don't expect to be blamed for every crime committed by a US soldier, especially when he will be put on trial and imprisoned if found guilty. Lastly, while the picture you sent is very powerful and dramatically sad and you can by association conclude that they died as a result of the US invasion of Iraq, there is really no way to conclude that an American actually killed them. I didn't send you a link to the story about the terrorists in Iraq who just killed Margaret Hassan. Margaret was an Irish woman married to an Iraqi man who by all accounts did more for the people of Iraq in the last 20 years then a thousand of these insurgents are likely to do. I realize that frustration in the rest of the world especially Egypt and other neighbors of Iraq is very high. I actually don't mind this kind of conversation so long as you don't take offense to my having a response and likely a different world view. I hope my response does not chill our relationship as I have felt that over the last year, we have had a good camaraderie as fellow developers. I am so glad that the election is finally over. Media overload the last few months. Now we can all get on with our jobs, lives, etc. I won't comment on the election anymore except to say that the protesters are gone from Union Square and that is the most welcome development. Yea Right. Mark my words, the European Commission pressured Airbus using the anti-US European governments that prop up Airbus to drop its brief via pressure from Airbus' parent the (heavily subsidized) European Aeronautic Defense and Space Company. These strongarm measures have to go. The EU should look up capitalism in the dictionary. At least Michael Moore admits he is biased. The 9/11 Commission has went too far. It needs to be de-commissioned and is a waste of taxpayer money. In case you are not following, the commission was put together to find out what happened on 9/11 (I thought evil terrorists flew planes into buildings). In <?xml:namespace prefix = st1 ns = "urn:schemas-microsoft-com:office:smarttags" />USA political speak, it was put together to point fingers. The 9/11 commission came to New York yesterday. The 9/11 commission hearing yesterday in Manhattan turned into a series of angry finger-pointing exchanges — and one panel member ripped the city's response to the World Trade Center attack as "not worthy of the Boy Scouts." I have never been so angry in my life. The emergency response team of the City of New York are absolute heroes. Every last one of them. I personally worked at the September 11th Fund for almost a year working on a database that distributed donations to the widows and orphans of the over 350 deceased cops and firemen. The money came from average Americans. They seem to agree with me. To suggest that the emergency service people did not do a good job or even to suggest that they were unprepared is simply wrong and proof that the 9/11 commission has taken itself too seriously. Before 9/11 the largest disaster the city had to deal with was maybe a bad hurricane, not terrorists flying 767s into buildings. The fire department usually loses 3 or 4 firemen a year in bad fires. That day over 350 firemen died while responding to fires on the top floors of the world’s 3rd and 4th tallest buildings. Then those buildings collapsed and it took over 3 months to put the fires out and almost a year to clean up the debris. If the Clinton Administration knew about 9/11 they would have tried to stop it. If the Bush Administration knew about 9/11 they would have tried to stop it. We need more human intelligence Cold War style against al Qaeda. The Emergency Service Personal in New York, DC and PA are true American heroes. I have the Hero Stamp issued by the Post Office to prove it. I have to say that today I am proud to be a member of the Association of Competitive Technology since its inception. I have been very active with them, ACT has put me in front of Congress several times on a variety of tech issues. ACT is demanding that the state of <?xml:namespace prefix = st1 ns = "urn:schemas-microsoft-com:office:smarttags" />Michigan and the U.S Department of Justice immediately withdraw their lawsuit against Oracle Corp, a suit I find silly. ACT won’t bring this up, but in the late 90s when ACT was advocating the DOJ drop their lawsuit against Microsoft, Larry Ellison, Oracle’s absolutely insane Chair and CEO hired a private investigator to go through our garbage in the ACT headquarters in Washington DC. So I have a pretty large personal dislike of Larry, and still think the DOJ is wrong. If you agree or disagree with her, this is good reading. The al Qaeda terrorist network posed a threat to the United States for almost a decade before the attacks of Sept. 11, 2001. Throughout that period -- during the eight years of the Clinton administration and the first eight months of the Bush administration prior to Sept. 11 -- the U.S. government worked hard to counter the al Qaeda threat. During the transition, President-elect Bush's national security team was briefed on the Clinton administration's efforts to deal with al Qaeda. The seriousness of the threat was well understood by the president and his national security principals. In response to my request for a presidential initiative, the counterterrorism team, which we had held over from the Clinton administration, suggested several ideas, some of which had been around since 1998 but had not been adopted. No al Qaeda plan was turned over to the new administration. We adopted several of these ideas. We committed more funding to counterterrorism and intelligence efforts. We increased efforts to go after al Qaeda's finances. We increased American support for anti-terror activities in Uzbekistan. We pushed hard to arm the Predator unmanned aerial vehicle so we could target terrorists with greater precision. But the Predator was designed to conduct surveillance, not carry weapons. Arming it presented many technical challenges and required extensive testing. Military and intelligence officials agreed that the armed Predator was simply not ready for deployment before the fall of 2001. In any case, the Predator was not a silver bullet that could have destroyed al Qaeda or stopped Sept. 11. We also considered a modest spring 2001 increase in funding for the Northern Alliance. At that time, the Northern Alliance was clearly not going to sweep across Afghanistan and dispose of al Qaeda. It had been battered by defeat and held less than 10 percent of the country. Only the addition of American air power, with U.S. special forces and intelligence officers on the ground, allowed the Northern Alliance its historic military advances in late 2001. We folded this idea into our broader strategy of arming tribes throughout Afghanistan to defeat the Taliban. Let us be clear. Even their most ardent advocates did not contend that these ideas, even taken together, would have destroyed al Qaeda. We judged that the collection of ideas presented to us were insufficient for the strategy President Bush sought. The president wanted more than a laundry list of ideas simply to contain al Qaeda or "roll back" the threat. Once in office, we quickly began crafting a comprehensive new strategy to "eliminate" the al Qaeda network. The president wanted more than occasional, retaliatory cruise missile strikes. He told me he was "tired of swatting flies." Through the spring and summer of 2001, the national security team developed a strategy to eliminate al Qaeda -- which was expected to take years. Our strategy marshaled all elements of national power to take down the network, not just respond to individual attacks with law enforcement measures. Our plan called for military options to attack al Qaeda and Taliban leadership, ground forces and other targets -- taking the fight to the enemy where he lived. It focused on the crucial link between al Qaeda and the Taliban. We would attempt to compel the Taliban to stop giving al Qaeda sanctuary -- and if it refused, we would have sufficient military options to remove the Taliban regime. The strategy focused on the key role of Pakistan in this effort and the need to get Pakistan to drop its support of the Taliban. This became the first major foreign-policy strategy document of the Bush administration -- not Iraq, not the ABM Treaty, but eliminating al Qaeda. Before Sept. 11, we closely monitored threats to our nation. President Bush revived the practice of meeting with the director of the CIA every day -- meetings that I attended. And I personally met with George Tenet regularly and frequently reviewed aspects of the counterterror effort. Through the summer increasing intelligence "chatter" focused almost exclusively on potential attacks overseas. Nonetheless, we asked for any indication of domestic threats and directed our counterterrorism team to coordinate with domestic agencies to adopt protective measures. The FBI and the Federal Aviation Administration alerted airlines, airports and local authorities, warning of potential attacks on Americans. Despite what some have suggested, we received no intelligence that terrorists were preparing to attack the homeland using airplanes as missiles, though some analysts speculated that terrorists might hijack airplanes to try to free U.S.-held terrorists. The FAA even issued a warning to airlines and aviation security personnel that "the potential for a terrorist operation, such as an airline hijacking to free terrorists incarcerated in the United States, remains a concern." We now know that the real threat had been in the United States since at least 1999. The plot to attack New York and Washington had been hatching for nearly two years. According to the FBI, by June 2001 16 of the 19 hijackers were already here. Even if we had known exactly where Osama bin Laden was, and the armed Predator had been available to strike him, the Sept. 11 hijackers almost certainly would have carried out their plan. So, too, if the Northern Alliance had somehow managed to topple the Taliban, the Sept. 11 hijackers were here in America -- not in Afghanistan. President Bush has acted swiftly to unify and streamline our efforts to secure the American homeland. He has transformed the FBI into an agency dedicated to catching terrorists and preventing future attacks. The president and Congress, through the USA Patriot Act, have broken down the legal and bureaucratic walls that prior to Sept. 11 hampered intelligence and law enforcement agencies from collecting and sharing vital threat information. Those who now argue for rolling back the Patriot Act's changes invite us to forget the important lesson we learned on Sept. 11. In the immediate aftermath of the attacks, the president, like all Americans, wanted to know who was responsible. It would have been irresponsible not to ask a question about all possible links, including to Iraq -- a nation that had supported terrorism and had tried to kill a former president. Once advised that there was no evidence that Iraq was responsible for Sept. 11, the president told his National Security Council on Sept. 17 that Iraq was not on the agenda and that the initial U.S. response to Sept. 11 would be to target al Qaeda and the Taliban in Afghanistan. Because of President Bush's vision and leadership, our nation is safer. We have won battles in the war on terror, but the war is far from over. However long it takes, this great nation will prevail.